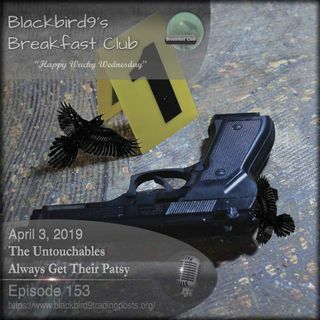 Welcome to Blackbird9's Breakfast Club's Wednesday Podcast, The Untouchables Always Get Their Patsy. Tonight we discuss the Federal Bureau of Investigation (FBI) . In the First Hour we cover the chaotic events brought on by the teachings of the Frankfurt School Marxists. Their mission has always been to establish a Greater Israel ruled by globalism under the direction of Talmudic ... See More Noahide Law and at the same time force all other nations to surrender their independent sovereignty. In the second hour, The Untouchables Always Get Their Patsy, the host examined the history of the Federal Bureau of Investigation (FBI). From the origins of Spycraft as the world's second oldest profession, to the aspiration of rulers to be as Omnipotent, Omniscient and Omnipresent as God, to the inner and outer circles of the Exoteric and Esoteric where The TRUTH is always a secret, to Sun Tzu's five classes of spies in the Art of War, to the Battle of the Old World and New World Banks, to The Great Experiment of the Constitutional Republic of 1776, to the Pinkerton Detectives of 1850, to the establishment of the US Secret Service in 1865, to the career of J. Edgar Hoover, to the rebranding of the Federal Bureau of Investigation in 1935, to The Untouchables TV series of 1959, to the assassination of President Kennedy in 1963, to the non-Investigations of OKC, USS Cole, 911 and the Anthrax by FBI Agent Dale Watson, to Fast and Furious, to the Robert Mueller Russian Collusion Investigation, the host discussed the history of the American Federal Secret Police and its checkerboard history of Law Enforcement and Political Expediency.